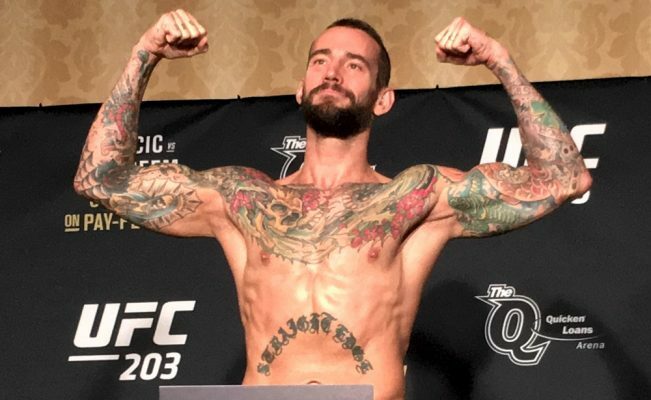 CM Punk has no control over his placement on any card when he’s competing and that includes his upcoming fight against Mike Jackson at UFC 225 in Chicago. The bout order for the June 9 event was announced over the weekend with Punk’s fight with Jackson serving as the opening matchup on the pay-per-view main card. Meanwhile, former women’s bantamweight champion Holly Holm will face off with Megan Anderson in a featherweight fight that will headline the UFC 225 preliminary card on FS1. Following that announced, Punk received a mountain of blowback that he’s competing on the pay-per-view in only his second professional fight while Holm and Anderson are relegated to the prelims. Punk answered those criticisms by explaining that he’d have no problem serving as the curtain jerker for the entire show but obviously that decision is really up to the UFC. The reality is Punk’s placement on the main card isn’t an accident because the UFC knows the former WWE superstar is still a draw, especially when he’s going to be competing in his hometown of Chicago. Punk certainly helped boost pay-per-view sales for his debut fight at UFC 203 back in 2016 and it’s likely his star power will bring in more viewers for his second bout at UFC 225 as well. That may not jive well with some UFC fans but there’s little doubt that Punk will certainly draw a lot of eyeballs when he fights and that means more money being made at the end of the day.